Karma Go, a contract-less Wi-Fi hotspot device, is to ISPs as Sling TV is to cable. When it shipped this summer, Karma only offered internet service as a prepaid data pack, for which you can buy and use in your own time. But for power users, now you can opt for more. Karma today announced Neverstop, an unlimited data plan for $50 a month. The plan still runs on Sprint’s network, though it will cap speeds at 5 Mbps so it’s not designed for a literal Netflix and chill all day everyday. If you don’t need unlimited data all the time, you can also switch between Neverstop or Refuel (pay-as-you-go) month to month. When you are on Neverstop, instead of earning 100 MB every time you share your public Karma network, you’ll get $1 off your next bill instead. Not a bad deal if you’ve ever left Karma open in a busy airport. You can also download the Karma iOS or Android app to reload your account on the go. Karma CEO Steven van Wel tells TNW he hopes the Karma Go could be the solution for creatives who work on the go, allowing them to operate wherever they travel – or, at least in the United States for now. The Karma Go dongle is available for $149. 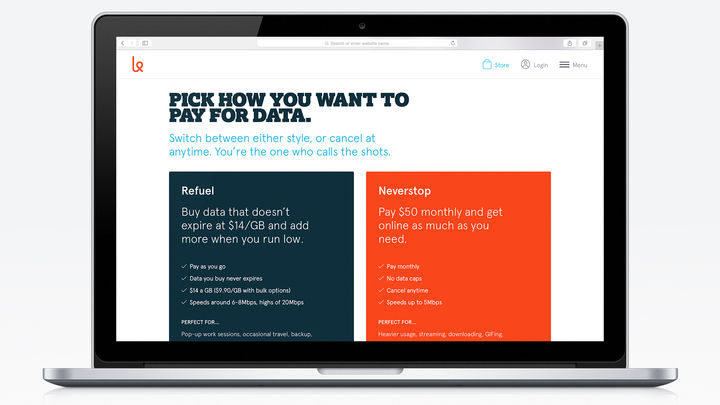 If you opt for Refuel, one gigabyte of data starts at $14.